I came across this e-book one day on the Amazon website, and was instantly attracted to its theme. I have delivered talks to audiences in Taiwan for many years, and I’ve always sought out ways to improve. Seeing that it covers many important aspects of giving and delivering talks in an ELT context, I bought it and downloaded it right away. This e-book is quite short, and could probably be finished in an afternoon. However, that’s not to say that it’s short on content. The author packs a lot of useful information into the book, and covers all the important issues of presenting. Lansford’s book gives clear advice to anyone in ELT considering giving a talk or wanting to improve their public speaking skills. The book consists of several sections: The Role of Talks in the World of ELT, Preparing a Talk, Delivering a Talk, Delivering a Webinar and Improving Your Game. In the book’s first section, he presents three reasons ELT experts give talks at conferences: to share ideas, to build professional credibility, and to sell books. He also separates ELT talks into three categories: more academic, more practical, and very practical. This part of the book helps the reader clarify why they intend to give a talk and what type of talk they want to give. After that, Lansford explains the important issues of giving a talk. Here, the author addresses the most common questions of novice presenters, including “Should I use a microphone?”, “Should I use notes?”, “How should I deal with challenging questions or comments from the audience?” and “How should I deal with nerves?” The answers are well thought out, and clearly expressed. Reading this section should make anyone new to giving talks a bit more confident and ready to deal with challenges. In the next part, Lansford covers webinars (web-based seminars), a recent development in presenting, where the talk occurs online, and made interactive through technology. He explains the difference between webinars and live presentations, and explains the best way to prepare for a webinar. There are also several tips on making a webinar run smoothly. Finally, the last section of the book gives advice on improving at giving talks. He suggests doing presentations frequently, and recommends a few books on the subject. Several features greatly increase the value of this book. For example, each section contains a task, consisting of a list of questions to help the reader reflect on the content of the section and find ways to relate it to his or her own experience. Also, several sections contain links to TED talks that highlight some of the points of the book. I was also impressed by practical tips provided by experienced ELT presenters such as Steve Taylor-Knowles, Evan Frendo and Sue Kay. 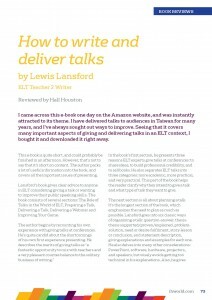 I thoroughly enjoyed reading How to Write and Deliver Talks. Although I’m not new to giving talks myself, this title gave me a lot to think about. The next time I am planning to give a presentation, I will dip into this book again for ideas on how to do a better job. I recommend this book to anyone who is considering doing an ELT-related talk. Hall Houston is a language teacher in the Department of Applied English at Kainan University in Taoyuan, Taiwan. He has a Master’s degree in Foreign Language Education from The University of Texas at Austin. He is the author of several books about language teaching, including Provoking Thought and The ELT Daily Journal. His latest book is Brainstorming, co-authored with Gerhard Erasmus, and published by the round. His practical articles have been published in English Teaching Professional, EFL Magazine, and OneStopEnglish. His professional interests include second language listening, materials development, creativity and critical thinking. He is a Cambridge English teacher trainer and presenter. Back to Issue 42: June 2017 of the IH Journal of Education and Development.